The Chicago French Market continues to support local artisans with its spring feature Marché du Printemps. Rotating visiting artisans will sell their unique jewelry, accessories and more; daily from 8 a.m. to 6:30 p.m. from March 4 through March 29. Modeled after the French Christmas market, Marché de Noel, Marché du Printemps provides a fantastic atmosphere and unique shopping options, with plenty of opportunities to find something new to spruce up your home or wardrobe. Artists will sell all types of jewelry, accessories, kid’s items and many more gift options. 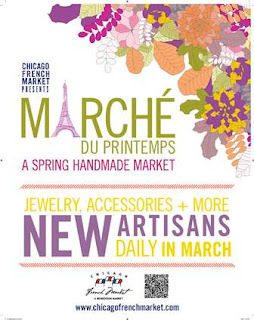 A variety of new items will be featured at the Chicago French Market during this time as well.